Can you advise the link to purchase the horse picture in this room? Bedroom paint - Hi, I'd love to know what colour the sliding door is painted in and by whom? Thanks! Dare to bare It may be a cliché to claim that exposed brick equals warehouse style, but it does make a statement that speaks to this rough and ready aesthetic. 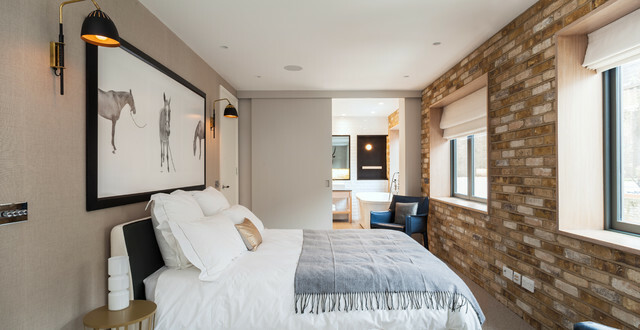 Few of us are about to start ripping off plaster, but there’s actually no need, as it’s easy to create a brick-effect wall using pre-made panels, which are screwed into place. This clever textured cladding is a quick way of adding bucketfuls of character. Slide along a wallIf you’d like a pocket door but don’t have enough depth in the wall to conceal it, opt for one that simply slides in front of the wall. Instead of choosing a standard door width, it’s a great idea to go as wide as the wall can support. This will create a feeling of the two spaces being open-plan. However, this can make the door very heavy to use, so ensure you take the best advice on the mechanism and door furniture. Also consider what the door is made of, so you don’t add too much weight. How long will it take? The actual taking down of a wall doesn’t take long at all – probably not much more than a couple of days – but the factors discussed above (such as moving plumbing and/or electrics) add complications, which will inevitably alter the proposed timescale.On average, allow 3-5 weeks, as working with existing buildings (as opposed to new-builds) is always unpredictable. For example, you might think there are no pipes or wires in the wall until the first blow of the sledgehammer – then you’re on a voyage of discovery! Most competent builders will have come across this many times and will have allowed for it in their price and project timescale, but it’s always worth adding on a few extra days to the builder quotes just to allow for those annoying unknowns.